Jean-Baptiste Menigoz, the former teacher and cross country skier, that completely changed his life after having his first naural wine in 2004. This was a Jean Foillard Côte du Puy, and he was sold. He gave up his sporty life completely and when not educating kids he worked together with winegrowers such as Raphael Monnier and Stephane Tissot to learn, and of course, to drink wines. In 2009 he went and studied oenolog school. So in 2012 he felt well prepared to start out on his own and made his first wines from 2 hectares. 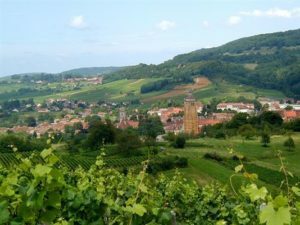 His vinery is located in the tiny village of Abergement le Petit, just 5 kilometres outside Arbois. 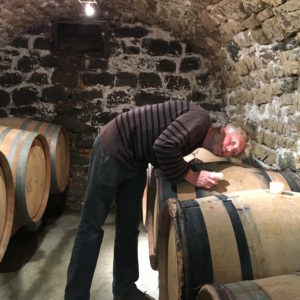 In 2015 Florien Kleine Snuverink arrived to work with him and today they have 7 hectares in total, spread out around their little village and also on the slopes above Arbois. They own half of it and rent the rest, but all vineyards are farmed by them, this is very important for them. When it comes to Florien, you can easily say that she’s quite an unexpected sight here. Former restaurant owner from Amsterdam, that went to Beaujolais to make wine together with Yvon Metras some years ago. She got stuck with the work in the vineyards and with the wines, but searched for a nicer view and found Jura and Jean-Baptiste. Today they are partners in crime and develop the work in the vineyards and winery together. They make a lot of different experiments in the cellar, to find out the superior expression of each plot every year. We are so happy to be able to work with these guys and follow their progress. The whites are almost only ‘ouillé’ (topped-up) ones. Those are lively, intense in fruit, with fresh acidity and fine minerality, each cuvée is really personal and different-so you need to drink them all to feel the essence of the Domaine. The exception from the topped up wines is a ’Vin Jaune’-which is still under progress, and tastes nice so far. 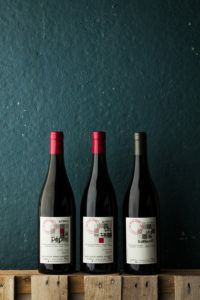 Their reds are intense, red-fruity, aromatic and flirty. Vinification: Direct press before fermented in steel tanks. Bottles with some sugar left in November 2018 to create perfect bubbles in the bottle. Vinification: Direct press before fermented on stainless steel and aged for 14 months in 400 liter old oak barrels before bottling. Vinification: Direct press before fermented on stainless steel and aged for 14 months in 500 liter old oak barrels before bottling. This is a mix between their 2 wines ‘Les Nouvelles’ & ‘Leon’ due to the terrible frost they suffered in spring 2017. We love the wine but hope they won’t do it again. Vinification: Direct press before fermentation in 400 liter barrels and ageing in various old oak barrels, bottled in September 2018. Vinification: Destemmed before 15 days of maceration, without extraction. Then careful pressing before continuous fermentation and then ageing in 600 liter old oak barrels, bottled in April 2017. Vinification: Direct press before fermenting and then aged for 12 months in 500 – and 600 liter old oak barrels, before bottling. Vinification: Direct press before fermenting on 400 liter barrels and ageing in one 3000 liter old oak barrels, bottled in December 2017. Vinification: Direct press before fermenting on steel and then ageing in 3000 liter old oak barrels, bottled in December 2017 with 7 grams of sugar left. Vinification: Destemmed before 10 days of maceration, without extraction. Then careful pressing before continuous fermentation and then ageing in stainless steel tanks. Bottling took place in September 2017. Vinification: Destemmed before 21 days of maceration, without extraction. Then careful pressing before continuous fermentation and then ageing in stainless steel tanks, Bottling took place in September 2016. Vinification: Destemmed with 3 weeks of maceration, without extraction, on stainless steel. Then careful pressing before 1/3 ages in stainless steel and 2/3 in 600 liter old oak barrels. Bottling took place in September 2017. Vinification: Destemmed before 20 days of maceration, without extraction. Then careful pressing before continuous fermentation and ageing in stainless steel tanks. Bottling took place in December 2018. This is a mix between all their normal red cuvées, because of the terrible frost in 2017, they were only able to make 1 wine. Vinification: Direct press of the grapes. 2/3 grape juice (vintage 2013) and 1/3 Marc (vintage 2012) is blended and aged on tank for 1 year before bottling.